A prominent feature of the new Learning Resource and Research Center will be Memorial Plaza, a brick walkway surrounding the high-traffic approaches to the LRRC and Firefighters Memorial Hall. Individuals, businesses and organizations can be a permanent part of the building and IFSI’s work by sponsoring paving bricks in the Plaza. A limited number of bricks will be available and can be personalized with engraved messages. With your inscription, you may choose to memorialize a fallen firefighter, honor a friend or family member, or identify yourself or your organization as a supporter of IFSI. 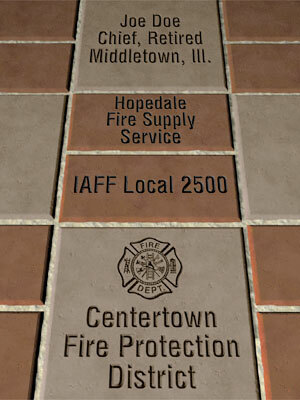 An engraved paver can also be a unique, meaningful and lasting gift. Your sponsorship of a paver in Memorial Plaza will distinguish you as a friend of the Illinois Fire Service Institute and a partner in the new Learning Resource and Research Center. Most important, your contribution is an investment that will help us continue improving the safety and security of emergency responders and the citizens they serve. Use the online form below to order your paver today. You may also use this paper form.